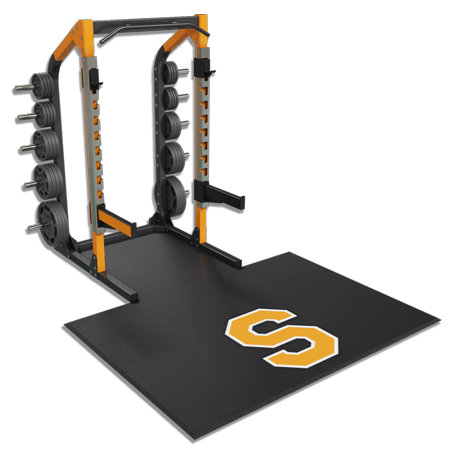 New or replacement platforms for your weight room. American Platforms all-rubber weightlifting platforms are made to fit your new or replace old platforms. High School and University coaches are replacing old and tired platforms with new and sleek, all rubber weightlifting platforms from American Platforms. Using our custom platforms make replacing old platforms or simply adding new weightlifting platforms to your weight room easy and affordable. Schools are responsible for the conditioning, performance, and safety of several student athletes, which creates demand on the weight room and other conditioning resources. Professional weight room design maximizes the use of the space and resources available with key equipment like weight lifting platforms. It’s easy to get your new weight lifting platforms to fit your rack. Simply measure the inside dimensions of your rack and provide to us for quoting and production. Add your logo or mascot to your new all rubber weightlifting platform. We can match your logo design and colors to give you and your team the perfect look and feel. WHAT IS THE DIFFERENCE IN OUR WEIGHTLIFTING PLATFORMS AND OTHERS? American Platforms are USA made and all rubber, with only a 20 mm height and beveled edges where exposed. 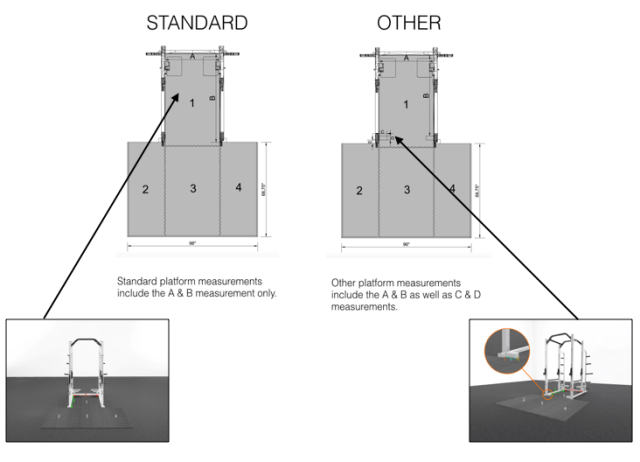 Other platforms are 2″ to 3″ in height and only have a front mounted transition to your base floor when purchased. American Platforms reduce sound and vibration by more than 50%, where the competition doesn’t. Compare our pricing with the others, you will be glad you did. CAN YOU FIT PLATFORMS TO ANY RACK OR RIG? Yes we can and we do this all of the time. It is very simple to custom fit our all-rubber weightlifting platforms to your current or future racks and rigs. In most cases all we need are two dimensions of the inside of your rack and we can generate a quote and then build the platform specific to your need. CAN I REPLACE MY EXISTING WOOD PLATFORMS WITH THESE RUBBER PLATFORMS? Yes, we will help you with the details, but we have made it extremely easy to replace your existing, tired and worn out wood platforms. We will provide you with specific and easy to follow instruction on how to replace your weight lifting platforms. Replacing your wood platforms with all rubber American Platforms can be done at a fraction of the cost of replacing or refinishing what you have now. CAN I CONNECT THE PLATFORMS OR MUST THEY BE SEPARATE? We have had several customers that preferred a connected platform with several racks. This allows you to have more floor surface to use for activities such as plyometrics and other ground based conditioning, other than lifting. CAN I INSTALL THE PLATFORM AND LOGOS MYSELF? Yes, both the platform and logo are very simple to install. The platform is installed with interlocking pieces, which you are provided a simple component sheet that shows how the platform pieces are put together. The logos are also quite simple, as we provide an installation video to help you move through the installation quickly. The average time spent installing our logos are between 10 – 15 minutes. 24 – 48 hours after we have received all information, such as size, quantity and where the order will ship to. If you are adding custom logos, we would need an image of your logos and the desired size, which they range from 2’x2′, 2’x3′, or 3’x3′. We do offer custom sizes that can be much larger for your school logo or mascot that can be as large as 12′ in diameter. Yes! Send me specials and news.